Posted 8/19/2018 12:15pm by Cheryl. And in the blink of an eye, another busy week has buzzed by! 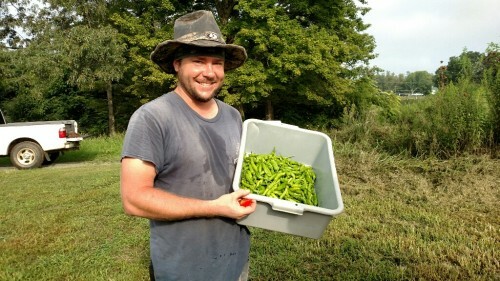 We've got our hands full with trying to tend for crops that are in the ground as well getting more crops planted. And we are making good progress on both. 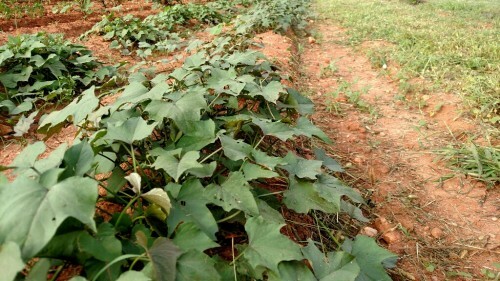 One of our favorite winter squash varieties, Seminole, holds a special place in the Demo Garden. It's an heirloom with an incredible taste (and amazing shelf life) but has vines that are worthy of place in in fairytale history along with Jack's bean stalk! This year we planted 2 hills of the seeds back in June in our 4x8 raised bed and they have been growing like crazy ever since! 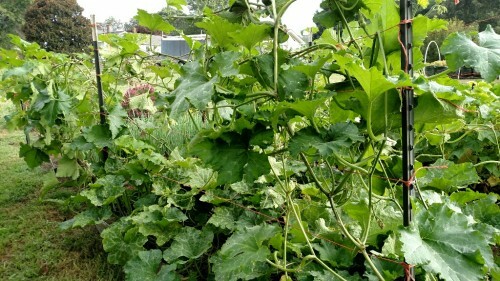 This week, we finally got the vines wrangled and trellised. They are no longer invading every other bed in the garden! 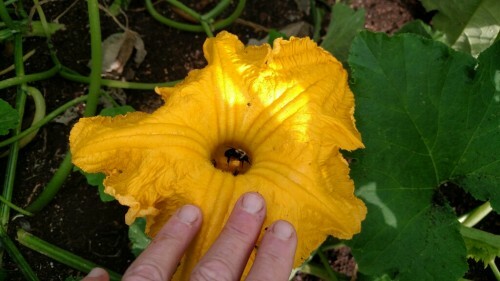 Check out the size of the flowers! 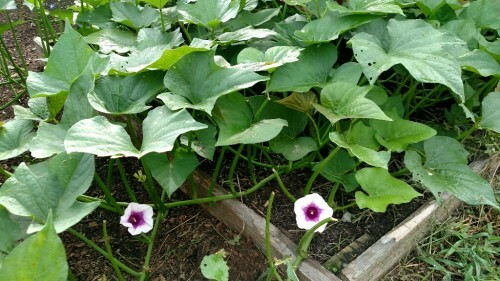 The sweet potatoes are doing great! Our larger planting is really spreading out (now that we've got the field fenced so the deer won't munch on the leaves!). The smaller planting in the Demo Garden already is beginning to flower. 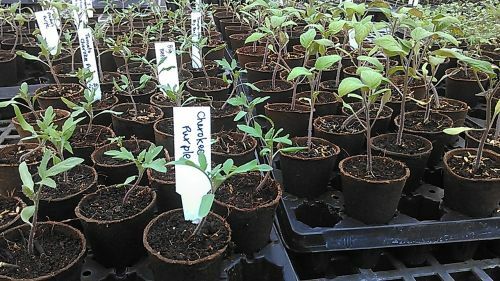 We've also been getting lots of things planted including snap peas, daikon radishes, beans, bunching onions, along with a late trial of cherry tomatoes. The greenhouse has been humming too! 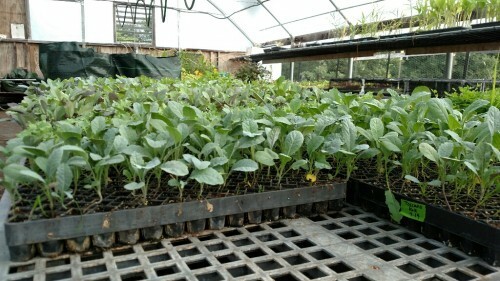 Seedlings of kale, cabbage, kohlrabi and broccoli are raring to go outside. And the cucumbers and tomatoes that were planted 2 weeks ago already need to be trellised! Pest control is a big thing at this time of year. Late summer heat and humidity seem to bring out the worst. 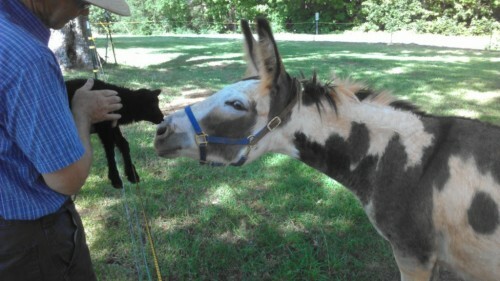 But it's nice when we have help from other critters in the battle. 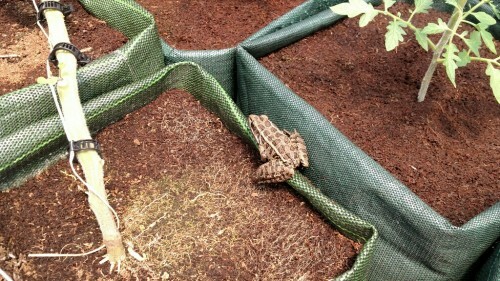 Although we haven't seen him at work, it's nice to have a toad in the greenhouse. They can eat LOTS of insects! You Go, Mr. Toad!! 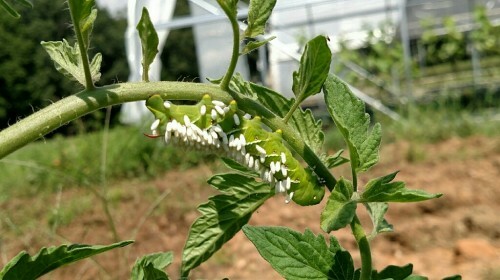 Parasitic braconid wasps do a great job of controlling tomato hornworms. They lay their eggs in the worm and by the time the wasp pupae emerge, they have pretty much eaten the hornworm's insides and it will die. A bit gruesome, but it is a highly effective way to control the destructive hornworm! 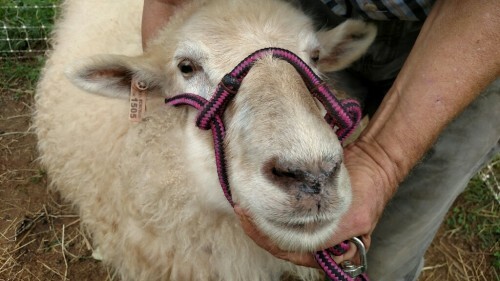 Happy Birthday to Ewe! And Tony Too! Sunday is National Potato Day! Did you know there are over 4,000 varieties of potatoes and that the Incas in Peru started cultivating them around 8000 BC? Better get ready for a GREAT celebration by stocking up on all things potato-y under the purple tent! 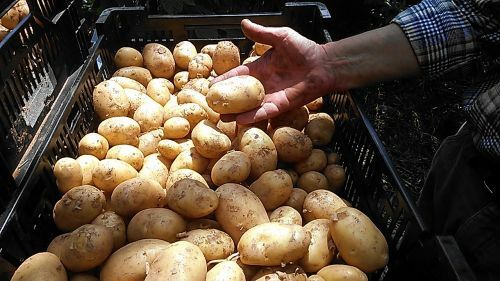 You'll find the delicious Bintje Potatoes -- the original French fry potato from the Netherlands along with Russet, Raspberry and the last of the Nicola and LaRatte Fingerlings. We'll also have boxes of tasty creamers. We'll have Rosemary and Italian Parsley to compliment your spud dishes! We'll also have those tasty Shishito Peppers -- the mild and yummy Bar Food of Japan! And don't forget the Garlic! 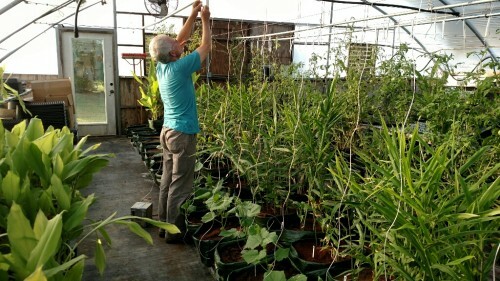 At least 6 varieties of Bulb Garlic (Red Toch, Music, Chesnok, Red Neck Wild!, Lorz and Elephant) along with Garlic Sampler Bags and Garlic Granules. You'll find plenty of Basil, Pea Shoots, Sunflower Shoots, Microgreens and Dill as well as a smattering of Escarole, Cucumbers, Summer Squash and Okra. 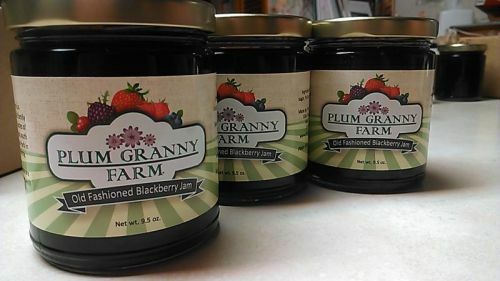 That's all the news from Plum Granny Farm for this week! Find a nice spot in the shade this weekend, pull up a blanket and picnic and listen to some mighty fine tunes from Aretha Franklin. RIP to the Queen of Soul.